Do you want to uncover hidden wireless networks? Well, check this list of the best SSID finder tools to discover hidden wireless networks. Every day you turn on the computer, tablet or mobile phone, you found a lot of WiFi networks around you. Among all of them, there are some that are open for anyone to use, while most are usually protected with an access code. But regardless of whether they are password protected or not, you can see the name or SSID of all of them. However, there are some hidden WiFi networks or with the SSID hidden, so when searching WiFis around you, you will not be able to see them easily. Hidding your WIFI name, which is known as SSID, is something you can do from the configuration of the router, but the question that comes to many do you increase the security of your WiFi if we hide it or hide its name (SSID )?. The truth is that hiding the SSID of our WiFi can be a double-edged sword. On the one hand, you can prevent individual users from trying to access your WiFi if they don’t see it at their fingertips, but on the other side, it is cannon fodder for hackers, since there may be some important reason why you are hiding it and be subject to all types of attacks. So, on this post, I will show you some of the best SSID finder tools to discover hidden wireless networks. NetStumbler is an SSID finder tool for Windows that allows you to analyze all the wireless connections we have at our disposal. Not only it reduces to detect them, but it shows you a right amount of information about it like the SSID (name of the network), the channel by which it emits, the speed, the type of encryption and even the MAC of the access point and the manufacturer. The utility is maximum, especially for people who often work with wireless networks and is oriented to solving problems, locating interference even the intrusion of unauthorized access points in our range. It supports the 802.11abg standards and even has a mini version for Windows CE devices. Currently, it goes by version 0.4.0 and is entirely free. 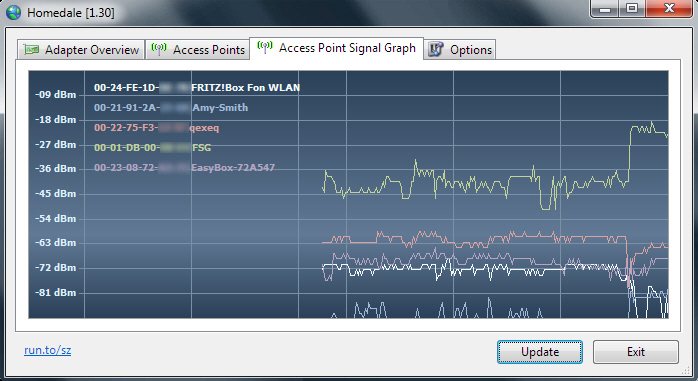 inSSIDer is one of the best SSID finder tools developed by metageek. It is available only for the Windows platform, although there is an alternative for Linux called LinSSID that can be installed through a .deb package or external repositories. The objective of this tool is to analyze and help you improve the quality of our WiFi wireless connection, allowing you to visualize and analyze the radio spectrum of your environment. The radio spectrum is how the frequencies of electromagnetic radio waves that will enable telecommunications are transmitted, such as radio, mobile telephony, internet, DTT. In this way, with this analysis software, you can study which frequencies are the most saturated in a particular place and choose, according to this information, the WiFi channels that will offer a higher speed to your connection. inSSIDer also will help you to discover hidden wireless networks around you. Acrylic WiFi is the SSID finder tool to discover hidden wireless networks and also check their security. This program is developed by the Spanish company War logic and is compatible with the latest Microsoft Windows operating systems, including of course Windows 10. Thanks to this Acrylic WiFi software, you will be able to verify all the available Wi-Fi hotspots from your surroundings, and in fact, will help you to configure the best emission channel in your router, to obtain the best Wi-Fi coverage and speed in your home. This SSID finder tool currently has four different versions of Acrylic WiFi. However, you have at your disposal an Acrylic Wi-Fi Heatmaps version that will allow us to make complete heat maps of Wi-Fi networks, ideal for comprehensive studies of coverage in hotels, universities or open spaces. And finally, you have the Acrylic WiFi Law Enforcement version, a tool that is specifically designed for security forces, and that will allow you to research a non-intrusive way, and control potential objectives, detecting them and monitoring them in detail. 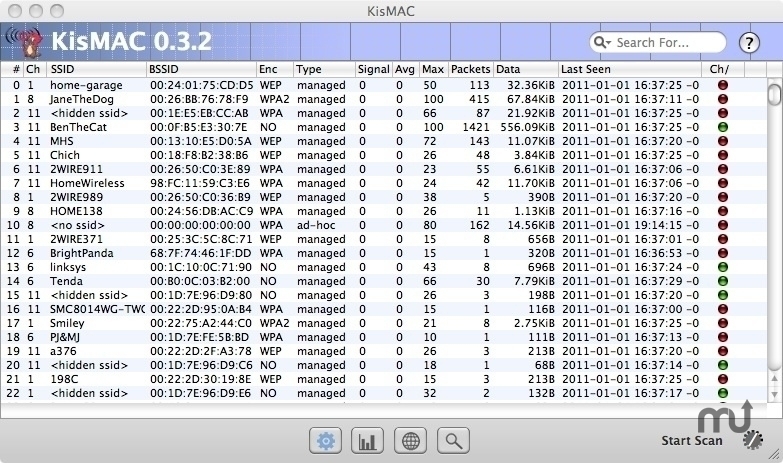 KisMac is the only SSID finder tool for OS X in which the most common attacks on WiFi networks, such as breaking WEP encryption keys or cracking WPA/WPA2, Authentication Flood and Deauthenticate – the famous attack 0 – are available. All this, in addition to being Open-Source, free and having a web interface to facilitate its use. Among its features, it also has a geolocator and a signal intensity graph of nearby networks, in addition to the typical window where information appears of the networks discovered by your Wireless card. To perform injections card packs with one of the necessary chipsets listed in this list of compatible hardware provided by your Wiki since we can use the card Airport Extreme which is built into the Mac from Apple. 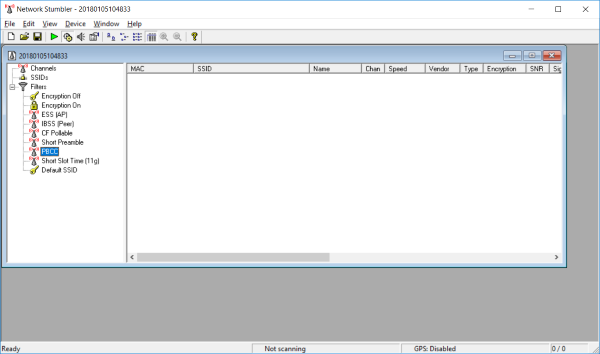 WirelessNetView is a small free SSID finder tool for windows and doesn’t require installation, which will allow you to monitor the activity and know some details of the wireless networks that are near you. Today, you practically find wireless networks everywhere, this program can come very well for you, when connecting to one of them, determine their security, if they have authentication, the type of encryption, etc. WirelessNetView updates the list of networks that it finds automatically every ten seconds so that you can see the changes that occur and the new networks that are detected are being added to your list. Although the program doesn’t connect itself to the detected networks, with the data it offers, you can make the connection yourself, and it always works in the background so as not to interfere in the work you are doing. Logically, to use WirelessNetView, you need your PC to have a wireless network adapter, either integrated as a PCI card or even in a USB device. WirelessNetView only gets information regarding the detected networks; at no time does it interfere in any of them or decrypt its access codes. And another thing, WirelessNetView, finds more Wi-Fi networks than the Windows manager, for me, the Windows manager found me only seven networks, counting mine, while WirelessNetView found nothing else to open it 15 and a few seconds later I had found 18. WirelessNetView is functional since Windows XP systems up to Windows 10. On many occasions, you can find yourself with the need to analyze your environment to know how many wireless networks are operating in it. You can also examine the channels through which they emit and the nature of all these networks to configure yours as best as possible to obtain the best result and free performance of the highest possible number of interferences. An efficient and simple tool for this function is Homedale. 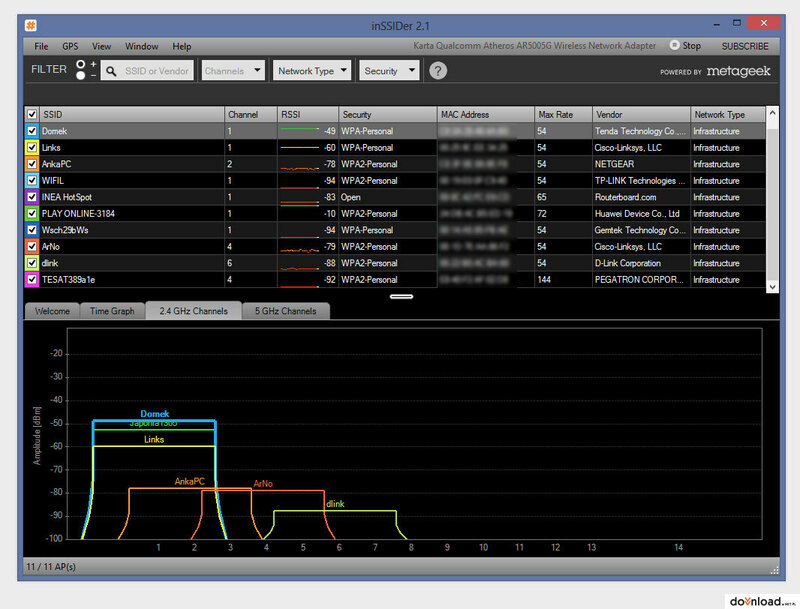 Homedale is a free SSID finder tool for Windows with which you will be able to analyze in seconds all the wireless networks within reach and obtain all possible information about them in graphic form. To start using Homedale, the first thing to do is download the latest version available from its main website. The app works in ” portable ” mode, so it does not need any installation, it will be enough to download the file, unzip it and execute it. Setting up and configuring a Wi-Fi network that guarantees a high connection speed and good coverage is a very complicated task since many factors influence it, such as the networks that exist around it and the channels in which they transmit these. To help you configure your network as best as possible, and at the same time to know the digital environment in which you live, you must use software that makes us a Wi-Fi network scanner and, in turn, helps you to configure the best possible this, as is the case with Xirrus Wi-Fi Inspector. Xirrus Wi-Fi Inspector is a free SSID finder tool designed to identify all the Wi-Fi networks you have at your disposal and be able to carry out the different configuration tasks. Depending on the networks around, it helps you to enter the best place to place your router and guide the antennas of the same to get the highest possible speed. Of course, it also will show you some hidden wireless networks that you can find using the Windows default wifi scanner. So far those were the best SSID finder tools that you can use to discover hidden wireless networks where you can try to connect. Do you use another tool? Let me know in the comments section to add it to the list.